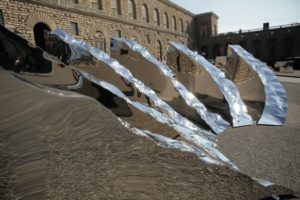 The solo exhibition by Helidon Xhixha In Random Order is taking place at the entrance of Palazzo Pitti, in the Boboli Gardens, and the San Firenze square until Oct. 29. The exhibit explores the dichotomous concepts of chaos and order, as well as the distinction between art and nature. Xhixha has created eight of the 15 sculptures specifically for this exhibition, while also showcasing works created between 2010 and 2016. The surfaces of his sculptures glisten and reflect like mirrors, simultaneously contrasting and complementing the surrounding cityscape, investigating intellectual and aesthetic themes derived from the 16th and 17th centuries– themes that also concerned the Medici family and the artists of the Renaissance. “Xhixha’s sculptures, however, are not solely the product of complex theoretical reasoning; rather, they offer an immediate, gut-level experience to the observer regardless of his or her age or intellectual formation. It is indeed rare for sculpture to succeed in drawing the attention of children and adults alike, yet both tend to engage in a lengthy exploration of Xhixha’s work, generally taking out their smartphones to capture their own image together with the images being reflected by the steel,” said Eike Schmidt, director of the Uffizi Gallery. “Knowledge and the Infinite,” standing in the square before Palazzo Pitti, distorts and refines the austere character of the city’s aesthetic, alluding to the harmonious beauty of the golden ratio, often found among nature, and harking back to the fundamental concepts of order, balance and regularity; “Giotto’s ‘O,’” which refers to the theory of perfection pursued by painter Giotto di Bondone, was notably chosen to inaugurate the renewed Piazza San Firenze. “Working in conjunction with the Gallerie degli Uffizi, we have decided to extend the celebrated Albanian artist’s one-man show into Piazza San Firenze in an effort to build a dialogue between contemporary art and the square’s spectacular baroque and Renaissance architecture,” said mayor of Florence Dario Nardella. Xhixha’s recent success at the Venice Biennale in 2015 and the 2016 London Design Biennale, along with many prestigious awards, have given him a position of prestige in the panorama of international art. His works are among the most recognizable and sought-after in the realm of contemporary sculpture, an achievement attributable to their natural depth and their ability to speak universally, despite cultural and intellectual differences.